I really love oats. Not only am I the type of person who wakes up ready and excited for breakfast pretty much every day, I also eat hot oatmeal year-round (a lot of people find this strange, but I love it!). 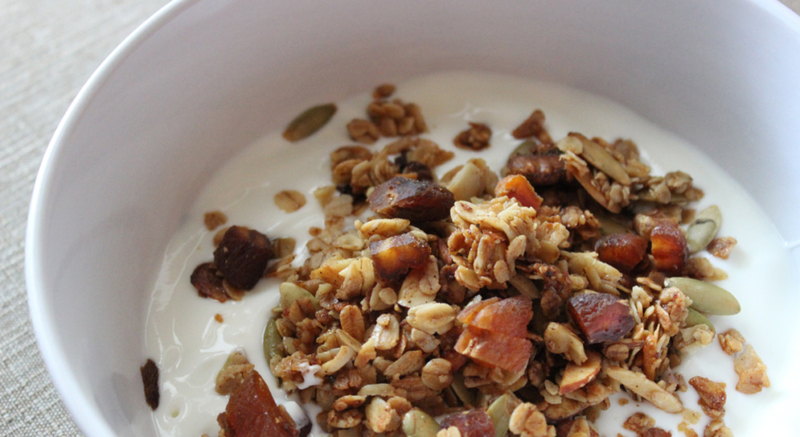 So, it should come as no surprise that I’ll take oats in nearly any form, and love granola a lot too. I’ve been on a big granola-making kick over the past few months. I never bought granola too often in the past, but since I’ve started making it more, I’ve become even more determined to not spend money on something that is honestly so simple to make. It is versatile, quick, tasty, and I always have the ingredients for some version or another on hand. 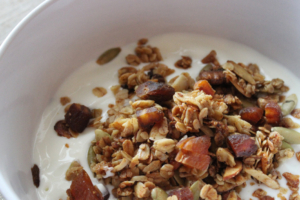 This recipe is something that came about from combining a bunch of other recipes and experiences in making granola, and using what I had on hand. I wanted to try out honey as the main sweetener for the first time, as it tends to do a better job binding the oats into clumps than maple syrup. I love that by making it myself, I can control what goes into it, how sweet or savory it is, and that it just tastes fresh and delicious. In a large bowl, mix together the oats, nuts/seeds, spices, and salt. In a small bowl, whisk together the olive oil, honey, maple syrup, and vanilla. Pour the liquid oil and honey mixture over the oat mixture, stirring well to coat. Pour onto two large sheet pans, lined with parchment paper. Bake at 350°F for 20-25 minutes. Stir the oats around the pan about halfway through cooking. 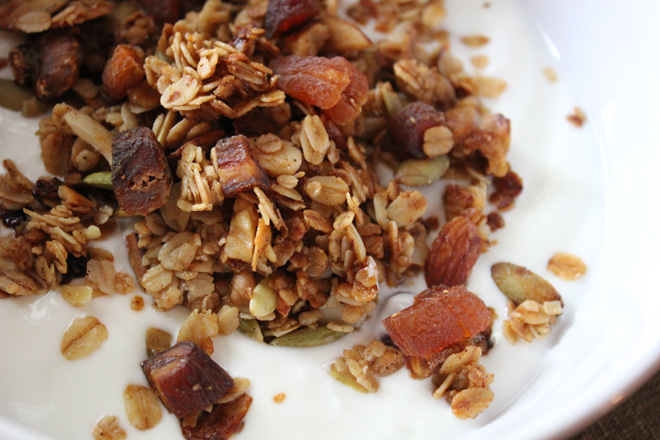 Keep a close eye on them, as the honey tends to make the granola brown more quickly than other sweeteners. Cool on cooking racks once browned and crisp, then add in the chopped dried fruit. Store in an airtight container. Enjoy over milk, yogurt, oatmeal, smoothies, cottage cheese, ice cream, or by itself for a delicious, crunchy, whole grain treat!